radio spectrum auctions. 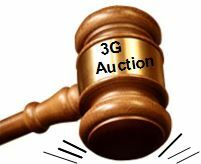 3G Auction. 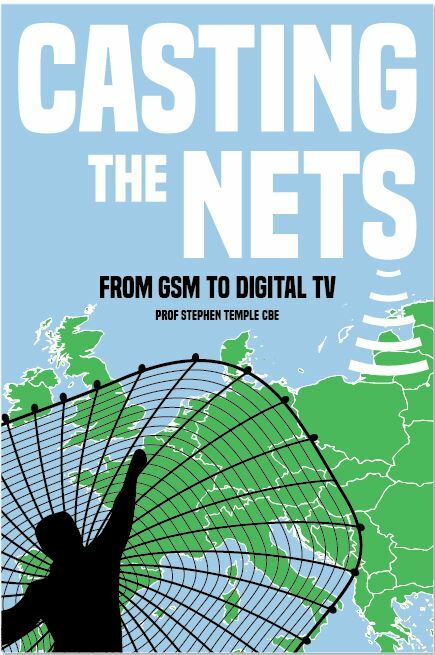 A cataclysmic event that drove Europe’s mobile system suppliers into recession, set Europe’s 3G networks back 5 years and made European governments a great deal of money. The UK staged the first of the European 3G auctions and it set the expectations for the auctions that were to follow in the rest of Europe. As with any auction it is the last entity to leave the auction empty handed that sets the price for the winners. This last entity out was a joint venture between ntl and France Telecom, with the activity based largely in ntl. ntl itself was created by two entrepreneurs who bought a few disparate UK cable TV franchises with borrowed money and grew at a frenetic pace to take over the entire UK cable TV industry…and burnt through $34 billion dollars in the process. It had to make a Chapter 11 bankruptcy pit stop to survive. But it could have been a lot worse…it might have won a 3G licence! In 1997 I found myself head of advanced technologies in the UK cable TV operator ntl. One of the jobs I had was to prepare the company for the UK 3G auctions. I led this activity until just prior to the auction itself when a colleague from our corporate HQ took over. This account and analysis views the 3G auction from this unique vantage point…the company whose final bid determined the price of those who won a 3G licence. ntl knew a lot about the cost of sites and radio masts – they ran the broadcasting sites for the independent TV companies. It also ran a fixed telephone network. It was well placed to know the cost of networks in general…it was just a question of understanding what was different about the 3G technology. The customer speed of “up to” 2 Mb/s being touted around was not all that it seemed. To obtain the 2Mb/s the customer would have to be standing right under the base station mast. One might as well install a public payphone box if 3G required all its customers to crowd under a radio mast to enjoy a 2 Mb/s service. A customer situation 5 miles away from the base station mast might only get 64 kb/s. That was hardly better than the GSM networks could be stretched to achieve. The key to getting high speed was to cut the maximum distance a customer was likely to be when connecting to the network. This in turn required a city or town to be covered with an immense concentration of small cells. These all cost money. A more practical speed expectation might be 384 kb/s ie five times less. Even this would involve massive investments just to cover the main cities, motorways and towns. Forget ever covering rural areas with a density of 3G networks cells to achieve this sort of high speed! The next surprise to emerge was the cost of connecting all the 3G cells back to the public networks. The 3G frequency channels were 25 times wider than the 2G GSM channels. This pushed up the cost of the telecommunications “back-haul” links to connect the base station cells to the cellular radio operator’s core network. We quickly arrived at a plan for around 6000 base stations and a price tag of around £1 billion. We knew we would have to subsidise 3G handsets. This was the way the GSM market worked and all the 3G operators would have to fall into line. Indeed a new entrant 3G operator was likely to have to pay bigger subsidies since it would have to buy its way into a market share. The comfort was that the semi conductor industry would be working over time to bring down the number of chips needed to build a 3G hand set and this would bring the cost down in due time. In this way the £400-500 initial cost of the first 3G handsets would inevitably fall to under £200 in time. We pencilled in £500 million of hand set subsidies to get its 3G customer base started. There was a lot of head scratching when it came to defining the market opportunity over and above simply grabbing a share of voice telephone calls. Into this vacuum the manufacturers exercised a lot of influence and nobody more so than Nokia. Nokia’s “3G technology” propaganda was in a class of its own. They had done some quite innovative work in stimulating a number of small Silicon Valley companies to try out ideas for Internet type applications on the mobile phones. They were also one of the champions of getting Internet Web site text onto mobile phones using a protocol they called WAP (Wireless Application Protocol). They showed us a graph of the steep world-wide growth in the numbers of mobile radio customers. This was a curve soaring upwards. They then showed a graph of the steep world-wide growth in the number of customers connecting to the Internet. It was another curve soaring upwards. We were invited to imagine the potential growth that would come from putting the Internet on a mobile phone. A market that would be the imposition of one high growth curve being overlaid on another high growth curve was a very compelling image. The 3G opportunity was an enabling technology to do this. The brouhaha going on in media on WAP phones in the GSM market lent credibility to the vision. There was something tangible happening even as Nokia spoke. If the industry was convinced that WAP would work for customers at data rates of 9.6 kb/s and tiny black and white screen – getting much higher data rates coupled with the best colour screens that Japanese industry were capable of producing…. this looked promising. Nokia did a good selling job on us and no doubt all the other prospective bidders. They also probably did much to convince the existing operators of the mistake they might make if they stayed out. The other major influence from manufacturers at the time was the prospect of “Japan Ltd” taking the 3G opportunity seriously and putting into the market compelling 3G handsets, exploiting their world lead in small colour display technology and digital camera technology. The negative factor was that all the market surveys showed the UK cellular radio market heading for saturation within two years or so. What this meant was that an operator could only gain a customer if one of the other operators lost one. This was not promising for any new entrant as, by then, all four of the incumbent operators were performing well. The trick any new entrant had to pull off was to hold its churn down to a few percent below the incumbent mobile operators and this would drive up the number of customers it gained. At best it could hope for a 16% market share as its optimistic target with 8% as the pessimistic lower bound. Telephone calls remained the bedrock of the business case. The really tricky bit was how much revenue a 3G operator could expect to extract from each customer from new data services? The application that most preparatory teams would have been comfortable with was ones that combined location information in the service being offered. This seemed “a natural” to offer people “on the move”. Views on the idea of using 3G to broadcast video entertainment or for use as videophones were mixed. The sceptics would have recalled that the wire line world had made three serious attempts to get videophones off the ground. None of them had succeeded. Video conferencing had crept its way to a niche market and stubbornly refused to break out of its niche status. Pricing a video call at a realistic level, noting that it would consume 8 times the capacity of a normal phone call, seemed an improbably mass application. There was probably nobody, who had run the numbers, left with any delusion of full-length movies being sent to 3G mobile phones. There was one video mobile phone concept that did appear credible. It was an idea known as “You see what I see”. The mobile phone would have a built in video or still image camera. The user would point at something that they wanted a person they were calling to see. A still picture or a short moving image would be captured, turned into a video file and the file sent over the 3G network to the person at the other end of the call. It was possible to conceive of a variety of circumstances where this might have application in business or meet a social need. And people would willingly pay for the video file to be sent. The 3G technology was offering a network that could send that file much faster. There remained other revenue opportunities to put into a business case. Advertising was one. The mobile phone is a natural “reminder” medium. For example an event organiser might want to suggest to customers that “tonight was the night of the big sports match” or whatever. What did all this amount to: a fight to grab a slice of telephone revenues, a few possible 3G video applications and a substantial slice of hope around the Internet on a mobile-phone. The final input to the business case was the price the 3G licences. The Government’s advisor, Rothschild, was busy using the media to set industry expectations. The £250m to £500m range appeared the current buzz. For most preparatory teams their business case stood up well with the assumption of £500 million. In fact the business case could sensibly absorb around £1 billion. But nobody was thinking of that sort of price in the 1999. On the 19th October 1999 an event occurred that was to prove cataclysmic for the 3G auction prospects, the mobile radio industry and wider parts of the global telecommunications industry. It was probably the biggest single contributor to the crazy prices paid at the 3G auction. Mannesmann announced to the market that it was in talks to take-over the UK cellular radio company Orange. Two days later it announced that it had clinched the deal for £19.8 billion. The offer comprised 0.0965 new Mannesmann shares and £6.40 in cash for each. This made an Orange share worth £16.29. Mannesmann was also to shoulder around £2 billion pounds of Orange debt. The effect of this news was electric. In 1996 Orange floated shares on the Stock Exchange at a price of £2.05. The price Mannesmann was offering amounted to nearly an 800% gain in 3 years. It was jackpot time for the lucky Orange shareholders. One journalist worked out that for the same price Mannesmann could have bought Marks & Spencer, Sainsbury and Next, with Rolls Royce thrown in. Even more revealing of the absurdity of the bid was the price Mannesmann paid for each Orange customers. At the time of the take-over Orange had 3.5 million customers and a modest 17% share of the UK market. The purchase price of £19.8 billion worked out at over £5,000 for each customer. In that month Orange happened to be selling a pre-paid package that allowed a customer to have a mobile phone for as little as £50 a year. A customer on that tariff would have to live for another 100 years to pay their contribution towards the purchase price of Orange! Even that calculation assumed that the Orange business was paying its way. It wasn’t. In 1998 Orange had turned in a loss of £105.7m on sales of £357.9m. Orange was still in the middle of its investment cycle for its network. add the £1 billion for the DTI licence. For a mere £5 billion a company could create a mobile entity that Mannesmann had just paid £19.8 billion for! Mannesmann had just re-set the value of a 3G licence. The price started with a “billion” on the end of it. The DTI auction was suddenly offering the key to a money printing press. Mannesmann had inadvertently fired the gun that started the stampede for a 3G licence at prices that would have been laughed at only a few weeks earlier. The mechanism was not to distort the 3G business models being prepared but to remove the lid on what the majority of companies were prepared to pay in the heat of the auction. Why did Mannesmann pay such an absurd amount of money for Orange? It had nothing to do with the profitability of the business. It was an enormously expensive tactic to fight off the possibility of an unwelcome hostile take-over bid. Vodafone was the unwelcome stalker. Mannesmann was rightly the pride of Germany. A leader of a sunset industry had re-invented itself as a successful industry of tomorrow. Mannesmann owed its success to one man more than any other – Klaus Esser. The day the deal with Orange had been announced Mr Esser and his colleagues were celebrating the tenth anniversary of Mannesmann’s entry into telecommunications. Just as Vodafone had been selected by the UK Government to be the new entrant in the UK market, so the German government had chosen Mannesmann as the new entrant for the German market. Vodafone would take on British Telecom in the UK market. Mannesmann would take on Deutsche Telekom in the German market. Like Vodafone, they had realised that success in cellular radio was to invest heavily. By 1991 they had spent £600m putting in a GSM network across Germany. These efforts were rewarded and the German second cellular operator went from strength to strength. It was the “Vodafone style success” story of Germany. The key difference between Vodafone and Mannesmann was that Vodafone had got its chance five years ahead of Mannesmann. That was a result of the Thatcher Government throwing open the UK telecommunications market to competition much earlier than the rest of Europe. It was the decisive factor on who was to come out on top in the battle of wills between the two companies. Once Vodafone had secured its leadership of the UK cellular radio market it looked overseas for expansion. Vodafone chased every opportunity vigorously. One of the rules they had worked out early in the game was to pay for acquisitions with their own shares and not to pay cash (or high yield bonds). To make this work required that the Vodafone share price had to continuously rise. They had luck on their side with the exceptionally long bull market that the world economy was enjoying. But they also worked hard for it. Vodafone was well run. They had a management team that worked well together. It was also a remarkably stable management team. This allowed a long-term strategy the time to work. By the late 90’s Vodafone was ready to make the leap from large regional player to global giant. Mannesmann, running 5 years behind, was still in its “regional” growth phase. In January 1999 Vodafone announced to an enthusiastic market that it had acquired the US cellular radio operator AirTouch for $62 billion in stock and cash and around $4.5 billion in assumed debt. Vodafone shareholders and AirTouch shareholders were each to own approximately 50 percent of the capital of the combined company. AirTouch itself had been no sloth in the race to gobble up stakes in cellular radio companies around the globe. The AirTouch acquisition gave Vodafone not only a strong position in the U.S. cellular market but new positions in India, Italy, Japan, and Spain. Germany was the only market where the two company’s operations overlap. Vodafone announced immediately that it planned sell its 17% stake in German mobile phone firm E-Plus so it could keep AirTouch’s stake in market leader Mannesmann Mobilfunk. This set the alarm bells ringing in Mannesmann. The Mannesmann Board had a certain comfort that German take-over laws stacked the odds heavily against a hostile take-over. But perhaps it was time to build up the defensive barricades a bit higher. One way to beat off any unwelcome bid from Vodafone was to buy-up a UK competitor to Vodafone and enjoy the protective shield of the UK or European regulatory authorities blocking any take over on competition grounds. The only problem was that there was no obvious way to buy any of the UK cellular radio operators. Vodafone was the only wholly publicly owned company. The AirTouch acquisition had put it right out of reach. Cellnet was owned by British Telecom. No chance there! Orange was considered relatively bid proof because it was 44.8 percent-owned by Hong Kong conglomerate Hutchison Whampoa, which had consistently said it wanted to use the British company as its expansion vehicle in Europe. This left One2 One that was jointly owned by Cable & Wireless and the MediaOne from the USA. In March 1999 an opportunity opened up. Cable & Wireless was about to make another of its strategy zig zags (or blunders as some might say). It decided to get out of the UK mobile market altogether. One2One was put up for sale. Five European companies expressed interest in buying it including Deutsche Telekom, France Telecom and Mannesmann. Deutsche Telekom was keen to break into the UK market. It was flush with cash from a secondary share offering. It was still suffering the humiliation of its botched merger with Telecom Italia. It was time for a bold knock-out blow. They stunned the market with an £11 billion bid. This valued each One2One customer at £2700. For the mobile radio industry it was a staggering premium to pay. For the financial institutions the calculators came out and mobile radio stocks were re-valued upwards. Mannesmann had shorter term problems. They had also let One 2 One slip through their fingers. They had been taken by surprise at the amount of money that Deutsche Telekom had put on the table. Worse, they could now feel Vodafone breathing down their necks. With One 2 One now out of play Mannesmann had to go for Orange. There had to be a price that made it worthwhile for Hong Kong conglomerate Hutchison Whampoa to sell its stake in Orange. By October Mannesmann had clinched crucial agreement with Hutchison for its 44.8 percent controlling shareholding in Orange. The price was £19.8 billion. Hutchison was given a 10.2 percent stake in the enlarged company. For the extraordinary price Mannesmann paid for Orange it won three things. First the combined value would make it much more expensive for Vodafone to take it over. Second, the regulatory authorities would not allow the Vodafone, the UK’s market leader, to own one of its UK rivals. Third Mannesmann became the largest of the European regional cellular radio players. Absent from this list was any notion of ever making a profit from this staggering “investment”. Vodafone was stung by the Mannesmann acquisition of Orange. The combined assets also dislodge Vodafone from its top spot in Europe. Mannesmann now had 7m more mobile subscribers in Europe than Vodafone. This had longer-term implications for the competitive position of Vodafone in the European market. Advisers to Vodafone put the word around that the `jury remained out” over whether or not to proceed with an attempted hostile take-over of Mannesmann. A hostile approach would be fraught with difficulties. A hostile suitor would have access to only limited information on a target company, making it difficult to work out the full consequences of a take-over. The structure of German management boards and the complex cross-shareholdings between banks and industrial groups also posed formidable barriers to hostile take-overs. A shareholder needed more than 75 per cent of voting shares under German law to exercise management control. Without it, it would be unable to remove members of supervisory boards, which are invariably dominated by representatives approved by a company’s workforce. In general the workforce representatives resisted take-overs because they usually led to job cuts. All this was in addition to a curious shareholding structure that stated that no Mannesmann investor could control more than 5% of votes. That rule expired in the summer of 2000, which has led some commentators to believe that Vodafone would bide its time before striking. Klaus Esser was to tell reporters at a press conference “I don’t see any realistic risk of a hostile take-over“. At least history appeared to be on his side. At the beginning of November rumours circulated in the media that top executives from Vodafone AirTouch and France Telecom had met within the previous fortnight to discuss a near £70billion joint break-up bid for Mannesmann and Orange, its new British mobile-phone subsidiary. Mannesmann shares duly surged nearly 30% over two weeks. On the 14th November 1999 Vodafone’s Chris Gent flew to Dusseldorf and met Klaus Esser. He tabled a “friendly” bid for Mannesmann’s telecommunications group of £64 billion. Klaus Esser,Mannesmann chairman, immediately threw out the offer as “wholly inadequate”. He said later in a public statement that “A deal would solve Vodafone‘s problems in Europe, but what does it offer Mannesmann?” This was followed up by a letter urging Vodafone to withdraw its proposal. Six days later there was a parting of the ways between the Anglo-US and German mergers and acquisitions culture. Vodafone tabled a £79 billion hostile offer. A wave of anger swept through German media and political circles. The offer was firmly rejected by Mannesmann. Vodafone’s share price slipped during the day reducing the value of the offer to £75 billion. This gave Mannesmann an immediate line of defence. Esser told the media: “The lack of cash makes such an offer very risky for our shareholders.”Mannesmann‘s supervisory board supported the Executive Board’s view that the offer was “entirely unattractive”. Vodafone set out a time-table for its bid. The offer would be made on Thursday 23rd December and it would be closed Feb. 7 2000. Vodafone would meet with its own shareholders on the 24th January 2000 and ask them to endorse the offer. In the meantime it set about wooing Mannesmann shareholders, many of which were institutions outside of Germany. This put centre stage the question of who were the ultimate decision takers of a German based public company – the shareholders or the management/employees. To emphasise where Vodafone believed the power of decision should rest it offered a sweetener to its deal that valued Mannesmann at £95 billion. A strengthening of the pound had allowed Vodafone some margin to improve its offer. The improvement in the offer had strings. It only “kicked-in” if the Mannesmann Board recommended the deal to its shareholders. Vodafone reasoned that failure of the Mannesmann Board to do this would expose them to their shareholders as standing in the way of them getting a really great deal. For weeks Esser and the Mannesmann Board tried to persuade investors that the German engineering and telecommunications concern would do better on its own. It also pursued other possible alliances. They held talks with French Vivendi about an Internet alliance in the hopes of staving off Vodafone‘s pursuit. Instead Vivendi formed an alliance with Vodafone. The damage to the credibility of the Mannesmann strategy far outweighed the potential value of the deal. Klaus Esser and the Mannesmann Board were fast running out of option. They knew that if the Vodafone bid were to fail the short-term prospect for their shares was not just a dip. They would dive vertically downwards. They could write off any notion of loyalty from the global financial institutions. But they could not depend upon German institutional shareholders to stand firm either. Even they had wider shareholder interests to protect. The raw power of Anglo-US capitalism was starting to bear down on the “consensus” German industrial structure. As the closing date for the offer loomed in the beginning of February Klaus Esser and the Mannesmann Board threw in the towel. There was no conceivable Mannesmann interest in prolonging the fight. Mannesmann shareholders emerged owning 47.2% of the world’s largest cellular radio operator. If that prospect did not appeal to them they had to option to sell their newly acquired Vodafone shares in an exceptionally bullish stock market for cash. Amongst those likely to have been taking some of their winnings in cash at the earliest opportunity would be the Hong Kong conglomerate Hutchison Whampoa, who had finished up with a lot of Mannesmann shares from the earlier Orange deal…which gifted him the capacity to flood money into the UK 3G auction and buy a way back into the UK mobile market. Everyone knew that the Vodafone purchase of Mannesmann would never get past the competition authorities unless Vodafone disposed of Orange. Disposing of Orange was therefore part of Vodafone’s plans. In fact Vodafone was depending upon the disposal of Orange to help pay for the cost of taking over Mannesmann. In that respect the Mannesmann ploy of buying Orange had failed as a hostile bid defence. In the meantime, Vodafone was the temporary owner of Orange…an unwelcome complication for the DTI and the 3G auction. As enthralling as the Vodafone battle for the control of Mannesmann was to the rest of the world, it was a nightmare for the Department of Trade and Industry. They were impatient to get their 3G auction under way. They knew the market conditions were right for the auction. Like everyone else they did not know how long this would this last. On the other hand pushing ahead with the auction with two of the prospective lead bidders, Vodafone and the owners of Orange, involved in a hostile take-over battle involving vast sums of money would itself be risky. There was considerable relief in the DTI when the battle was finally over. 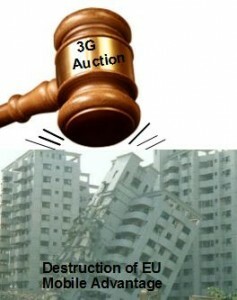 They quickly pushed ahead with plans for the 3G auction. The DTI received applications to take part in the auction from all four of the existing UK cellular radio operators Vodafone, British Telecom (Cellnet), Orange and One2One. In early February 2000 the DTI E-Commerce Minister Patricia Hewitt said that she was delighted to announce that the DTI had been able to qualify all the applicants and were on track for the auction to begin in March 2000. They held their breath as they awaited the reaction of the industry to their decision to allow Orange to enter the auction as well as Vodafone. British Telecom immediately protested. How could a company appear twice in the auction? They threatened to take the Government to Court. BT got in touch with the other registered bidders for support. Whether it was a reflex action that anything BT demanded from the Government had to somehow be against the interest of the other players or whether most were simply fast asleep but nobody else seemed bothered. In ntl’s case BT’s communication to us fell down between the cracks…I had just handed the project over to the corporate HQ guy. BT were on their own. They backed down. The DTI had won their bluff. They were, without doubt, on shaky ground. As it was, all the bidders then went into the auction having accepted the decision. In cloaks of massive secrecy almost all the bidders come to similar conclusions on the value of a 3G licence. They thought they might have to pay as much as £1 billion. Most were prepared to stretch themselves to as much as £2 billion if they really had to. The DTI’s own economists were still projecting £1 billion per licence as the very best case outcome for the DTI. The mobile manufacturers had done their best to inject some dot.com fizz into the mobile radio auction. The Government’s “Multimedia on the move” picture of increasing synergy between telecommunications and broadcasting had enriched the vision. By the day the auction the media had created the usual aura around 3G of “new services one could not yet even dream of”. Sitting well above the reality (or otherwise) of business cases, an image had been created around 3G of something desirable and indeed essential to be a part of. The bidders at the DTI 3G auction were without doubt in the high stakes, high risk and high reward business. Put another way they were gamblers. The casino owners were the Government. The DTI Radiocommunications Agency has always had one of the best UK Government Internet Web sites. They used it to great effect to keep the world informed of what was happening at the auction. Each round of the auction was reported upon within minutes by means of colourful charts. The UK DTI was running this particular casino in style. It was by far the biggest game in town. Round 1 of the auction saw Orange emerge as the only existing operator tabling a lead bid. A clutch of companies most people had never heard of also emerged as lead bidders. TIW, Crescent and Epsilon were not exactly leading names that would set the mobile radio world alight. More surprising was that one of the licences failed to attract an initial bid. This must have caused a flutter of nerves amongst the casino owners. Round 2 cheered up the ntl audience. ntl emerged as the lead bidder for Licence A. This was the licence set aside for a new entrant and it had by far the most radio spectrum attached to it. By Round 5 ntl had been pushed out of Licence A. By Round 6 it had hopped over and re-appeared in Licence C as the lead bidder. It was Round 7 of the bidding before BT appeared with a lead bid. They were pitching for the B Licence. This had the most spectrum of the licences available to all comers, including the existing UK mobile radio operators. Surprise! Surprise! Vodafone appeared in Round 8 and knocked BT off their Licence B perch. In the first 20 rounds it appeared to be anybody’s game. ntl and a company calling itself Spectrum Co slugged it out for the pole position for the A licence. Licence B, the best licence for the incumbent mobile operators, saw a contest between Vodafone and its “arms length” subsidiary Orange! By round 22 Orange seemed to get the hint that its new owner did not want it bidding on Licence B and it switched its predominant attention to Licence E.
A few companies made much of their super gamesmanship they played in their auction bid strategies. For all the good it did them. Vodafone’s strategy was announced well before the auction began. They would simply keep their hand in the air for Licence B until the last of the other bidders dropped out. For the entire 150 rounds of the DTI auction they pitched for Licence B. They were lead bidder for 108 of the 150 rounds for this licence, including the crucial final round. It evident from the record that Orange pitched into bidding seriously for the lesser Licence D from Round 22. They were lead bidders for Licence D for 90 out of the 150 rounds…all to be paid for with somebody else’s’ money. The mood of the most impartial observers of the auction gradually changed from one of excitement to concern. It took an incredible 77 further rounds before the field started to seriously thin out. The £2Bn barrier had been crashed through well before this. Epsilon’s last appearance was in Round 84, Crescent in Round 88 and One.Tel in Round 97. The exit of SpectrumCo in Round 93 left WorldCom, Telefonica, TIW and ntl struggling to seize Licence A. By Round 105 Worldcom had made their last appearance in the lead for Licence A and Telefonica had switched to one of the lesser licences by Round 109. Winning Licence A became a two-way fight between TIW and ntl. What ntl did not know at the time was that the little know TIW had a secret backer – the Hong Kong conglomerate Hutchison Whampoa, who was awash with cash from the Mannesmann take-over by Vodafone. The mood of the impartial observers had changed yet again. Concern had given way to incredulity as another £1Bn was put on the table. In Round 126 TIW knocked out ntl as the lead bidder on Licence A. Relief swept though everyone at ntl not concerned with the auction. Common sense has arrived at last. It was short lived. The relief gave way to disbelief as ntl swept back into the bidding for Licence A in Round 127 and held sway until Round 131. In Round 130 ntl had put on the table a mind blowing £4.277 Bn. In Round 131 TIW had put on the table an even more massive £4.384 Bn. It clinched Licence A for them. This was an auction that the ntl auction team seemed unable to leave. It switched its attention to one of the lesser licences. It went for Licence C. In Round 132 it managed to push Telefonica out of the auction. ntl had stretched its expectations as a result of bidding £4.277 Bin for Licence A. Scaling the amount of spectrum from Licence A to Licence C made it seem worth having a go for Licence C. Any hope of a licence was short lived. It had BT to contend with. BT had just been shoved out of the Licence B competition by Vodafone with a grand slam bid of £5.3848 Bn. BT got renewed energy by scaling its licence B losing bid to where Licence C now stood. It certainly was not going to be outbid by a relatively small market entity like ntl, even less was it going to let France Telecom into the party. By round 148 ntl put in a last gasp bid of £3.9705 Bn. In round 149 BT knocked ntl out of the auction entirely with a bid of £4.031 Bn. The Casino owners – the UK Treasury added up their “takings” from the auction. A staggering £22,477,400,000! Their expectation was a mere £5,000,000,000. Even that seemed a large sum of money to pay for a bit of paper that hitherto had been given away almost free and for new 3G services that nobody knew if consumers wanted. The mood of senior UK ntl management levels was one of relief that a 3G licence has not been won at such astronomic prices. I was attending a broadcasting industry show in Las Vagas and was on the ntl stand when we heard the news that we had lost…a great cheer went up. That must have been a first for Las Vagas for people to have cheered joyously having lost. Those who thought that the results of the DTI 3G auction in the UK would shock industry into moderating its behaviour at the other 3G auctions being held across Europe were mistaken. 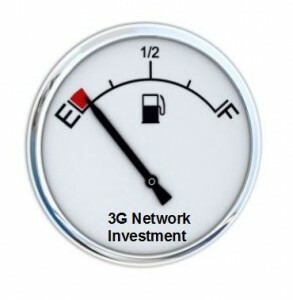 The German auction showed that industry had not shifted from its excessive valuations of the 3G licences. The bidders for the German licences included the existing German mobile phone operators – Deutsche Telekom AG , Mannesmann Mobilfunk (read Vodafone) , E-Plus-Hutchison, Viag Interkom (read British Telecom) and MobilCom (with France Telecom support). Total $42.75B or £28.5 billion – which on a population adjusted basis was very close to the UK outcome. Perhaps the most interesting outcome was the Italian auction. It was held in October of 2000. The expectation of the Italian finance ministry was high when, like the UK, it put up 5 licences for sale. Unlike the UK auction it only attracted six bidders rather than the 13 that pitched into the UK auction. Perhaps financial fatigue was setting in across the industry. Having said that, Italy is one of Europe’s major cellular radio markets. Lots of cars, lots of traffic jams and lots of people talking on their mobile phones. The bidders were all serious players and, for a while, things looked promising. The total bids quickly mounted to $11.6 billion. Then a spectacular public row clattered across the media between British Telecom and its Italian partner. Claim and counter claim of bad faith shot backwards and forwards. Whatever the truth of the matter the consortium just disintegrated. The Italian Ministry was left with five licences and five bidders. The auction stopped dead in its tracks. The finance ministry was mortified. Politicians struggled hard to find a conspiracy. There was none to find. Telecom Italia Mobile (TIM) – TIM is Italy’s largest mobile-phone company, 60% controlled Telecom Italia, and which in turn is 55% owned by Olivetti. Omnitel Pronto Italia – Italy’s number two wireless firm, 76% owned by Vodafone, and 23% by Verizon. Wind Telecomunicazion – Wind is majority-owned by Enel, the Italian State electric utility with significant ownership by France Telecom (43%). Finland’s Sonera (19%); and a group of Italian industrialists. The most interesting thing about the Italian auction is the price that the winners finished up paying. The total of $11.6 billion equates to roughly £1.5 billion per licence. The irony is that the fair price actually resulted from a failure of the auction process. The Dutch auction was a bit of a disappointing affair for the Dutch Finance Minister with the number of bidders matching the number of licences. It raised only $2.7 billion for five licences. The Danish Auction left its mobile radio industry with mixed blessings. The bids were sealed bids. Four licences went to the four enterprises that had bid the highest sums of money. Except under the Danish rules they all paid the fourth lowest bid price. That still led to a high cost of a 3G licence in Denmark of around 1 billion Krone. If all the bidders entered the first of Europe’s 3G auction expecting to pay £1 billion (or less) and all had set their extreme upper limit at £2 billion, it takes some explaining as to why they all emerged paying between £4 billion and £6 billion. By far the most powerful reason the existing UK cellular radio operators would emerge from the auction with a licence “at any price” was the anticipated effect on the companies share price of not getting a licence. The Wall Street Journal captured the mood just before the auction when it quoted a Chase Manhattan analyst as saying “If you lose a 3G license, you’re out of the game for ten years.”In other words any senior executive of any of the existing UK operators had to expect that the stock markets would massively hammer their share price if they didn’t get a licence. (The same stock market that was later to be aghast at the debt they clocked-up to pay the prices they finished up paying). The fact was that, for the incumbent UK operators in 2000, leaving the UK 3G auction without a licence was simply not an option. The choice for a chief executive was between instant death meted out by shareholders angry at the share price falling off a cliff or carrying a debt that might prove terminal later…Against the backdrop of a likely 10% drop in the share price of a large public corporation that the market was valuing at close to $200 billion, a bid of £5.964 billion was not entirely irrational. In fact the decision was entirely logical sitting inside the context of an asset bubble. The first was Orange bidding with somebody else’s money. They were not allowed to collude with Vodafone during the auction. So the only possible brief they could have been given was to pay whatever it took to get a licence. The second was the wealth of mystery bidder TIW. Unbeknownst to all the other bidders at the auction Hutchison Whampoa had cut a deal with TIW just before the start of the auction that had the effect of bankrolling their 3G bid. To get around the auction rules the deal was that TIW, if it won, would immediately lease its entire network to a joint venture with Hutchison Whampoa in which Hutchison would own 90% of the new network and TIW the other 10%. It was a legitimate thing to do but here was a player coming to the table with a secret backer that had recently had a huge windfall of money north of £9 billion from the Vodafone take-over of Mannesmann. So what kept nlt and France Telecom in the bidding to the very end? This partnership were the only new entrant bidder with a solid basis of UK assets and know-how to have made a success of a 3G licence. So in theory they really did know what they were doing. First, France Telecom knew that there were now only two routes it could take to get into the UK cellular radio market. It could buy Orange off Vodafone. Since Mannesmann had paid £19.8 billion for Orange in the first place it was hardly likely that Vodafone would accept any less from France Telecom. The second route was to get a 3G licence and work with ntl to create the fifth network. Mannesmann had created a wholly inflated point of comparison for the France Telecom Executives sitting in the heat of the 3G auction wondering whether to leave the table. Second, mobile radio was the missing piece in ntl’s highly successful bundling strategy. ntl were able to offer their customers a combined telephone, TV and Internet service. A mobile offering in the mix could be exceptionally compelling. Barclay Knapp would hang on in at the auction for as long as France Telecom would stump up the finance. So it really came back to France Telecom’s appetite for continuing the fight. Third was enthusiasm of the bid team itself. With each round of the auction, as the bids ascended, the ntl inner team tasked their KPMG advisor with re-working the business case. Perhaps ntl could expect a bit more revenue here, perhaps the average revenue per customer could be stretched a bit there, perhaps all direct debit could get the bad debt down to almost zero, maybe the churn could be a bit lower…..
By the time their bid hit £4 billion every parameter had been taken to its limits of plausibility. All that remained was the profit that might come by selling the network in 15 years time, the so-called “terminal value”. That is what sat behind the final bid of £4.2 billion, an investment that would never pay for itself over the life of the business plan and only justify itself when it was eventually sold to a wealthy investor in 15 years time. Even then every optimistic assumption had to come good at the same time. Finally France Telecom decided that buying Orange from Vodafone was the better options. In Round 148 ntl withdrew from the 3G auction and later France Telecom later bought Orange for £31 billion. France Telecom finished-up paying 35 per cent more for Orange than Mannesmann paid, excluding the UMTS third-generation mobile licence. Put another way it paid £6,700 for each Orange subscriber. Our Orange light user paying his or her £50 per year would now have to live on another 134 years to do his or her bit for France Telecom. When Rothschild’s were pressed by the media part way through the auction to justify the massive bids that were being put on the table, they were to patiently explain to the media that these were the worlds most sophisticated companies. And how! What seems to have been missed entirely by most observers was that the amounts of money paid for the 3G spectrum was a factor but not the main reason for the collateral damage to the entire European telecommunications sector. There is a compelling argument that the most damage was done by the rules on how the spectrum had to be paid for. Bidders for the DTI auction were given two payment options. The first was to pay the entire amount up-front immediately. The second was to pay half immediately and the other half could be spread over 10 years. The interest rate on the deferred amount was deliberately set at penal levels (from memory it was 3% over commercial rates and the commercial rates were around 6%). These were deliberately outrageous terms. Even then it had to be supported by a “bank guarantee”. The Treasury deliberately forced the auction bidders towards the commercial markets to borrow the money and pay the entire amount up-front. The mobile sector paid dearly for this Treasury misjudgement. It effectively hit a single industry with a £22B tax on a new 3G enterprise that had yet to earn a single pound. This was amplified across Europe. The financial markets, that played a big part in the asset bubble, then swung to the other extreme. They applied enormous pressures on the mobile phone operators to reduce the debt on their balance sheets. The easy way for for the mobile operators to do this was to cut back on their capital expenditure programmes. They did this savagely. It delayed the roll out of 3G in Europe by at least three years, coverage was patchy (and still is today) and it underperformed for the best part of 7 years. The large system vendors went from full order books to nearly empty order books in the space of 12 months and no company, however well run, could adjust to this catastrophic change in market conditions. They then all found themselves in deep financial trouble and the next move was to make redundant thousands of their staff. The sector went into recession. It is worth returning to the payment terms of the Danish auction. The winners paid 25% of the money up front and the remaining money was to be paid at 7.5% a year for 10 years. Those are very fair terms that helps industry cash flow as they build a speculative new 3G network with revenues being several years down the track. It does not require too many speculative assumptions to conclude that had the UK applied the Danish payment terms the UK mobile industry could have absorbed the £5 billion up front, had the capital to have rolled out 3G networks much sooner and not plunged the supply industry into a deep recession (a punishment of the innocent)..